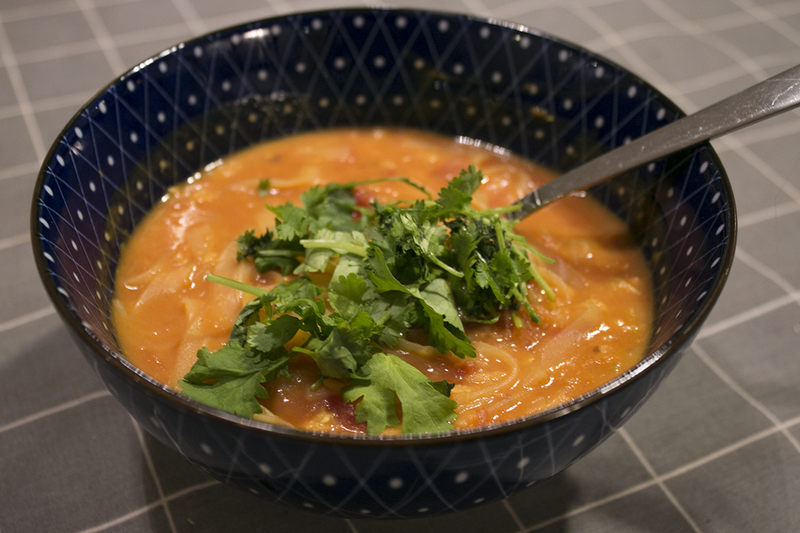 When I don't "have anything at home" and need to cook dinner I tend to make this tomato-lentil-noodle soup. I still always have lentis, crushed tomatoes and coconut milk at home, and this one is ready in no-time. Double the batch of soup if you want this to be Tuesday-soup and Wednesday-stew aswell, it tastes just as good a couple of days later! Cook everything together in the order above. Choose the amount of water yourself, depending on if you want your soup thicker or runnier. Season the way you like - I always add garlic, preferrably a lot, and some chili powder or a bit of vegetable broth to the water. You could also add a little red curry paste or perhaps some grated ginger. Serve with Sriracha sauce and garnish with fresh cilantro. Hemp seeds and/or salted peantuts on top makes this extra delicious.